Lisa Harewood is a socially motivated artist whose short film, “Auntie,” invites contemplation of Caribbean life, immigration, extended matriarchal families and those left behind. 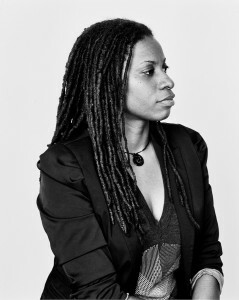 Her debut effort as a writer and director, Harewood’s film is the result of a last- minute decision to enter the Commonwealth Foundation’s development scheme. More than a lark, Harewood said she had a mere 40 hours to teach herself screenwriting after her initial pitch won a coveted spot in the festival. “I went into a great panic,” Harewood said. “I won, now I had to write it.” The resulting tale is that of a young girl, Kera, who is being raised by her “Auntie,” a parental surrogate who steps in following the preteen’s mother’s migration to London. A common occurrence in the Caribbean, this sort of arrangement has its downside, as neither child nor caregiver can know when their makeshift family could be torn apart, with deep ties irrevocably ruptured by the child’s departure to rejoin the migrant parent. So goes the story in Auntie. But there is another side to this issue. While not discussed explicitly in the film, the topic of assimilation into a new culture in one also fraught with problematic twists and turns. Reunification of a reconstituted biological family isn’t automatic, nor is the process always successful. For some families, the time spent apart can never be recovered. A motif that a “Caribbean audience always notes,” according to Harewood. The filmmaker included a blue shipping barrel in her film’s scene-settings for its ubiquity and significance in island communities. !“[The containers are] a constant reminder of the migrated family member, which can be a source of both pride and pain,” Harewood said. Once arrived to their destination, the containers are often kept and used for storage, to catch rainwater — like so many cried teardrops — outside the family home or used to store or plant food, etc. Such story lines were frequent for Harewood growing-up, with schoolmates’ whose parents were away living and working in places like Boston and Miami. And given estimates put roughly two-thirds of Caribbean nationals live outside the region, such global realities are no surprise, according to Harewood. !“International families,” as they are referred to in Trinidad, operate on the principle of networks rather than households, and are given form and content by women. Women figure prominently not only in Caribbean migration, but in the creation and maintenance of these families, blended as a result of a system of informal adoption (“child-minding”) which is a long-standing Caribbean tradition. Harewood herself, while not a “barrel child,” did have direct experience with an extended family, having been co-parented and raised by her matriarchs: mother, grandmother and aunt. The strength of these maternal ties is evoked in Harewood’s use of the kitchen table and other motif’s particular to world of domesticity, the realm of the film’s namesake, Auntie. “She’s not the type to be emotional,” Harewood said of the film’s matriarch, a character typical of older Caribbean women for whom “putting food on the table is her embrace. She wont tell you she loves you,” but she will provide, cooking cleaning, mending and maintaining clothes, as evoked by the characters’ interactions in the home at the kitchen table and outside at the clothes line. It is through such scenes that Harewood said she was able to establish her characters’ closeness, which later worked to heighten the sense of loss and longing, emotions present at Kera’s departure. The brokenness and loss of affection each are emphasized in the final scene in which Auntie sits alone on the beach, gazing off longingly into the horizon toward some distant shore. Harewood hopes the film which is set in her native Barbados will resound with AfroPop audiences while providing a platform for outreach to the a huge audience segment – the Caribbean Diaspora in North America – especially as it is part of an entire program tied to Caribbean Heritage Month. “It’s also exciting to think about the wider audience that the series will have amongst people who are genuinely interested in black life around the world,” Harewood said. As a new filmmaker coming from a country with no filmmaking infrastructure, being selected to be a part of such a noted series on my debut project is a great boost for me and the encouragement that I am heading in the right direction. Harewood’s first feature film production foray was in 2010. A Hand Full of Dirt, written and directed by Russell Watson, was nominated as a Best First Feature Film at the Pan African Film Festival in Los Angeles. The movie is currently being readied for market by Harewood’s production company, Gate House Media, and is a testament to the resourcefulness and tenacity that Caribbean filmmakers must possess to bring the region’s stories to light. Working with a shoestring budget and a largely non-professional cast, Harewood was able to draw on her 12 years of experience in the trenches of arts marketing, advertising, corporate video production and development support communication. Lisa Harewood. Photo courtesy Sophia Wallace. Harewood holds a BA in Mass Communication from the University of the West Indies and an MA in Creative and Media Enterprises from the University of Warwick in the U.K. Additionally, she completed a production course for independent film at London’s Metropolitan Film School, where she met and was mentored by acclaimed producer Jonny Persey. “Auntie” has already received critical acclaim, ahead of its scheduled June 16th release date. Harewood directs the film produced by Ian Smith. The third program in AfroPoP’s three-part exploration of immigration from the Afro- Caribbean perspective, Auntie, has an outreach component that hopes to bring awareness to migration issues as well as to pay tribute to the women who selflessly look after other people’s children. The filmmaker said her outreach will be based on raising awareness among local authorities to recognize the impact “stepwise” migration and long-distance parenting has on society, said Harewood. She hopes local, community-based programs and resources would be sprout up in support of, and to mitigate the trauma to children and their caregivers. You can see “Auntie” and other shorts in the AfroPoP Caribbean Shorts series here.